The Annual Energy Outlook 2015 (AEO2015), prepared by the U.S. Energy Information Administration (EIA), presents long-term annual projections of energy supply, demand, and prices through 2040. 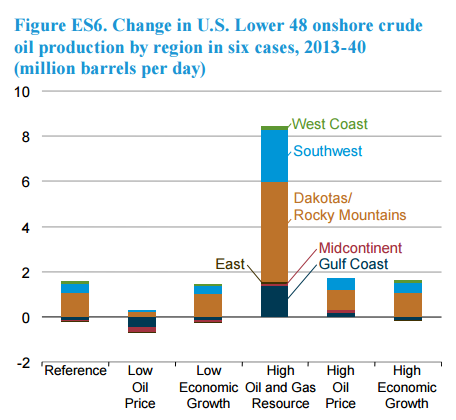 The projections, focused on U.S. energy markets, are based on results from EIA's National Energy Modeling System (NEMS). NEMS enables EIA to make projections under alternative, internally-consistent sets of assumptions, the results of which are presented as cases. The analysis in AEO2015 focuses on six cases: Reference case, Low and High Economic Growth cases, Low and High Oil Price cases, and High Oil and Gas Resource case. • Through 2020, strong growth in domestic crude oil production from tight formations leads to a decline in net petroleum imports and growth in net petroleum product exports in all AEO2015 cases. In the High Oil and Gas Resource case, increased crude production before 2020 results in increased processed condensate exports. Slowing growth in domestic production after 2020 is offset by increased vehicle fuel economy standards that limit growth in domestic demand. The net import share of crude oil and petroleum products supplied falls from 33% of total supply in 2013 to 17% of total supply in 2040 in the Reference case. The United States becomes a net exporter of petroleum and other liquids after 2020 in the High Oil Price and High Oil and Gas Resource cases because of greater U.S. crude oil production. 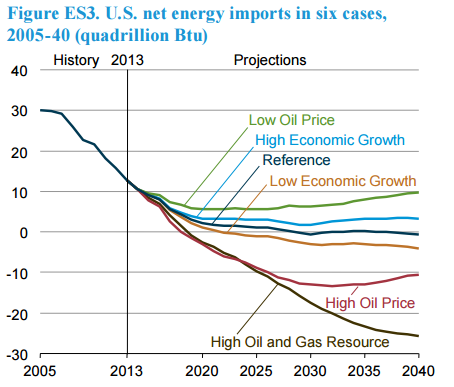 • The United States transitions from being a modest net importer of natural gas to a net exporter by 2017. U.S. export growth continues after 2017, with net exports in 2040 ranging from 3.0 trillion cubic feet (Tcf) in the Low Oil Price case to 13.1 Tcf in the High Oil and Gas Resource case.